I know I promised something about the interior of LDS Temples today, but Gale (who works at the More Good Foundation) left a comment on the last post offering to pass along some more information and pictures for me to use. So, I’m going to hold off on that until I have time to pour through it. For this week, I present 7 Facts About LDS Temple Architecture. I’m going to focus on some of the more common themes and the reasoning and symbolism behind them. The Angel Moroni is a central figure in Mormon theology. He is the guardian of the golden plates that now make up the Book of Mormon. 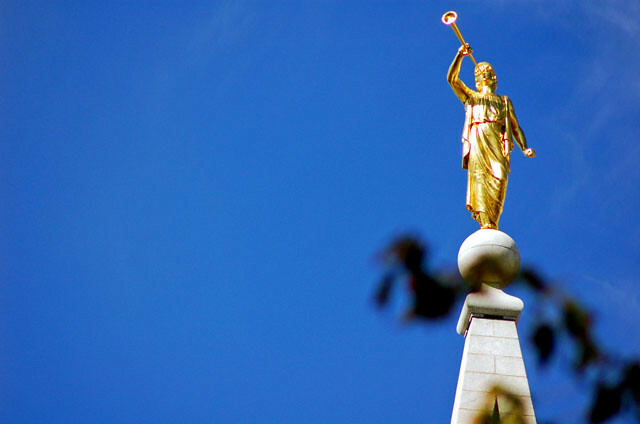 All but eight temples have a statue of the Angel Moroni on a spire of their temple. The vast majority of them point east, although a few point in other directions due to restrictions regarding building orientation. Statues of Moroni depict him holding a trumpet. This has been problematic in more earthquake-prone areas (like California and Japan) where the trumpet may be dislodged from the statue. A few Moroni statues depict him holding the golden plates, and a few remote temples depict him holding scrolls (both of these are in addition to the trumpet). The trumpet is symbolic of Moroni heralding in a return to the way Christianity was meant to be practiced. The Aaronic and Melchizedek priesthood are important concepts in Mormonism. Young men around the age of 12 (and adult male converts) are ordained to the Aaronic priesthood as a training period, and serve in positions like the diaconate. Then at the age of 18, men are ordained into the Melchizedek priesthood, which enables these men to bless their family on important occasions. How does this relate to temple architecture? Many temples have two spires (or sometimes two sets of spires) representing each of these priesthoods. Some of the early temples has two pulpits, one on either end of the church, facing one another, representing these two governing bodies. Mormon temple architecture can be broken down into roughly 10 categories. The LDS webpage does a great job of breaking them down quickly here. As you read through them, you can definitely get a feel of how the church is progressing, from initially starting out and moving headquarters to catering to smaller, more remote pockets of members. I’d also recommend checking out this graphic, which compares shows five different temples. The vast majority of LDS temples are built from scratch. However, a few aren’t, and require retrofitting an existing building to make it work. From what I can tell, these are always existing buildings owned by the LDS church that are converted. This is done for a variety of reasons – to save a building that’s no longer being used, or due to space and money reasons (such as in New York City). Although I mentioned in the last post that those without a temple recommend can’t enter the temple, you can still visit. A few of the temples out there have visitors’ centers, where anyone can go and learn more about The Church of Jesus Christ of Latter-Day Saints. Think of it as a museum about Mormonism. These stones are all symbolic decorations on the outside of a few Mormon temples. Each stone has meaning behind it; you can read more about them here. The basic premise is that they have a specific ordering – earthstones are at the base of the temple, working up to starstones at the top. They represent a passing of time, working up towards eternity with God. They are most prominently displayed on the Salt Lake Temple in Utah, but can be seen in a few other temples too. To get a better look, check out here (hover over the picture and the boxes to see descriptions) and here. Be sure to zoom in to get a good look! On the west tower of the Salt Lake Temple in Utah, you can find the constellation representing the Big Dipper. The idea is that the Big Dipper and Polaris have been used to guide people for ages. Similarly, temples are meant to guide Mormons towards a righteous life, and thus, God. I couldn’t find a picture of it that I could post here, but this is a good shot. This is specific to the Salt Lake Temple in Utah.